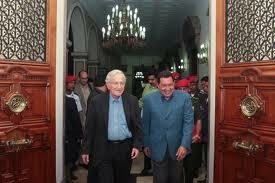 How gratifying it is to hear that Venezuelan strongman Hugo Chávez has fallen out with Noam Chomsky, arch-propagandist of the crypto-Islamic leftist global elite. Chomsky, previously a supporter of the rabble-rousing coup-leader, has given an interview accusing Chávez of amassing power in his own hands, intimidating the judiciary, and making an assault on Venezuelan democracy (whatever the heck that is). This denunciation comes at a particularly difficult time for Chávez whom – it was revealed this week – has just had a cancerous tumor removed by his Communist buddies in Cuba. The rift in the Chávez-Chomskyite axis has interesting possibilities for those of us in Washington who favor a return to a more robust engagement with our less-developed Hispanic neighbors. Could it be that, having finally seen through the “progressive” credentials of his erstwhile hero, the biggest critic of America’s role in the western hemisphere will now experience a change of heart? For all his past insults to the country and beliefs I love, I would be glad to have him on board. True, Lt Colonel Chávez has brutalized and imprisoned his opponents, socialized large swathes of Venezuelan industry, and incited global revolt against America’s benevolent oversight. But now that Chomsky no longer has his hooks in him, is it too much to hope that Chávez will live up to his underlying potential, and become exactly the kind of no-nonsense and proactive Latin leader that we used to have in the good old days, before Carter and Clinton wimped out on our Manifest Destiny? Pick up the phone, Hugo. It’s time you came in from the cold. As for you, Chomsky, somewhere out there is an ice-pick with your name on it.